Starting this Sunday, March 30th, Metrobus service will be restructured on the Hunting Point-Pentagon Line (Routes 10A,10B &10E) as well as some other nearby routes, such as the McLean-Crystal City Line (Routes 23A & 23C) to provide more direct service, enhance connections and provide additional service on the most heavily used portions of the lines. The changes come following a set of public meetings and an online survey set up last year to gain public input for improvements to service on a variety of bus routes, and most important to Arlandria: the 10A, B & E MetroBus lines. Begun last May, Metro was looking to identify the strategic needs and review the capacity, productivity, reliability, and quality of the Route 10A, 10B & 10E lines with and eye toward proposing recommendations and changes that will improve service. The factors that Metro is interested to improve included: reliability, frequency, crowding, travel time, bus stop amenities, and customer communications. During the a.m. peak period northbound (from Hunting Point) and the p.m. peak period southbound (to Hunting Point), Route 10R will replace 10A service. 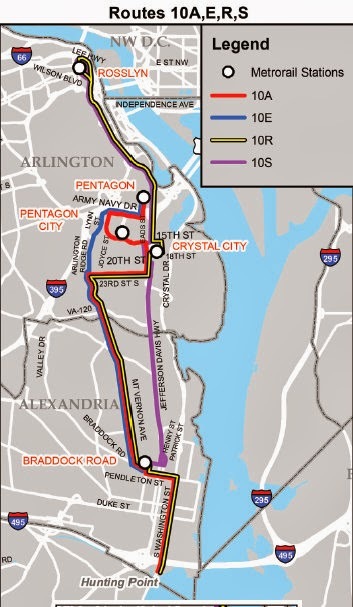 Route 10R will provide a direct connection between Crystal City and Rosslyn bypassing the Pentagon. Existing 10A passengers traveling to the Pentagon may take a Route 10E bus or transfer to Metrorail at Braddock Road Station. p.m. peak period northbound (to the Pentagon) 10A service. Service will operate weekday peak periods between Rosslyn, Crystal City and Alexandria. Routes 10R and 10S will bypass the Pentagon, saving passengers approximately 10 minutes of travel time between Crystal City and Rosslyn. Route 10A and 10E buses will continue to serve Pentagon Station. Route 10R will operate northbound from Hunting Point to Rosslyn via Crystal City during the morning peak period and southbound from Rosslyn to Hunting Point via Crystal City during the afternoon peak period. Route 10S will operate southbound from Rosslyn to Braddock Road Station during the morning peak period and northbound from Braddock Road Station to Rosslyn during the afternoon peak period. Pentagon. The weekday peak period schedule will be adjusted to provide a 15 minute time between buses. Route 10S service will replace all 9E service. Route 10S buses will not serve Pentagon Station. Route 9E riders traveling to the Pentagon may transfer to a Route 9A bus on Eads Street, or transfer to a Route 10E bus or Metrorail at Braddock Road Station. For new schedules and for more information about Metrobus service evaluation and corridor studies, visit wmata.com/betterbus.